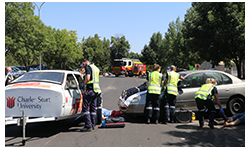 Charles Sturt University (CSU) Graduate Diploma of Clinical Practice (Paramedic) students last week took part in a car crash and night club explosion simulation, as part of their five-day residential school in Bathurst. * A group of 20 students completed the training in working temperatures up to temperatures of 70° C.
A group of 20 post-graduate students completed three days of clinical skills and finished off the week participating in simulations, to enhance their practical training. The simulations involved representatives from the NSW Fire and Rescue Department and NSW State Emergency Services (SES), which added an additional ‘real-life’ element. Paramedic subject coordinator, Dr Brian Sengstock said the simulations are an opportunity to put students in real life situations and apply their clinical skills. 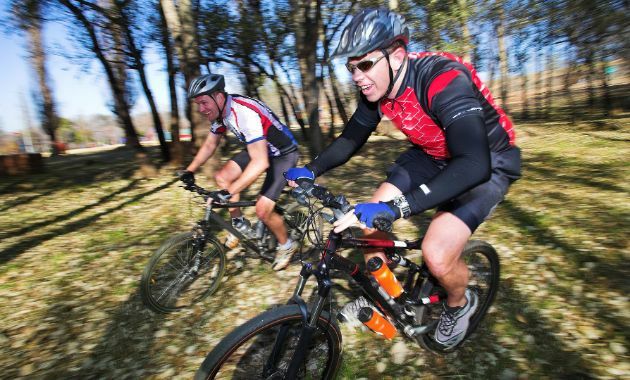 “While the simulations are part of the course requirements, it will also prepare these students for upcoming placements in February this year,” Dr Sengstock said. After the simulations occur students participate in a mandatory debrief, which looks at what worked, what didn’t and their individual role. Paramedicine student Paul Neil who drove from Coober Pedy in South Australia to Bathurst for the residential school, said that the simulations are a great way to go through the paces of an emergency situation realistically. “My role during the car crash simulation was the scene commander. This was the first time I’ve ever completed a simulation that involved mass causalities, so it was a really great learning experience.” Mr Neil said. 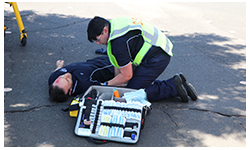 Paramedicine continues grow in popularity each year with the course delivered by national and international leaders, offering unique insights, skills and experiences. Contact CSU Media to arrange interviews with Dr Brian Sengstock.